Maybe if Scotland had opted for independence in 2014 the international context would now be different. Maybe the Brexit vote wouldn’t have happened and Trump would have lost. In such a scenario, the prospect of Catalan independence would have a very different meaning. 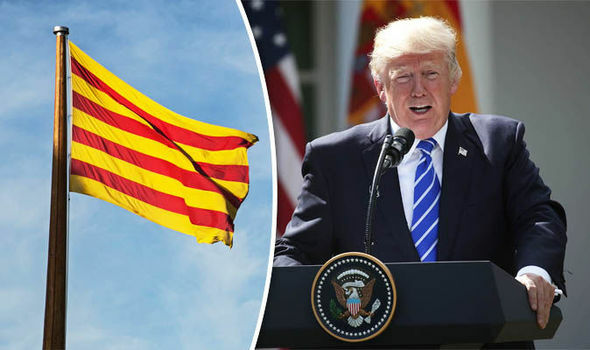 Catalonia is a country with a distinct culture, its own political traditions, a (partially recent) history of brutal oppression by the Spanish state and (most importantly) a consequent desire to be independent. The fact that it isn’t already is a pure accident of history. Nation states come and go; a country is, someone once, a dialect with a flag. As it happens, Catalonia has a very attractive flag, one that makes it look like its national anthem should be composed by Manu Chao. Partly as a result, Barcelona is generally seen as a a left-wing city – it has a radical mayor (who, as it happens, opposes independence). However, especially outside Barcelona, Catalan nationalism is not necessarily a progressive force. The Catalan left has nontheless partly presented this referendum as a vote against austerity and neo-francoist Spanish nationalism. (The spectacle of violent repression has given credence to the latter claim.) Nevertheless, a huge vote for independence will not be interpreted in such terms internationally. Nationalism, by definition, always involves a narrow set of concerns. The fact that deeply reactionary forces outside Spain will celebrate the victory concerns me more than the impact on dynamics inside the Spanish state. In the country where I live, Italy, the result will encourage the far-right to renew their campaign for more autonomy for the rich regions of the north, who have long complained about the burden of having to sustain the filthy peasants of southern Italy. There have been echoes of this kind of rhetoric in the Catalan case. Hence the support of the global far-right for independence. The Italian fascist leader Matteo Salvini and the British far-right party Ukip have expressed support for Catalan independence; should the vote be tallied and independence be approved, their allies such as Le Pen and the AFD will present it as another Brexit, a vote against the European status quo. The Kremlin’s propaganda outlet Russia Today has made no secret of its affiliation, some of Donald Trump’s few remaining non-bot social media enthusiasts have expressed principled, albeit somewhat selective, concerns about political violence, and Julian Assange has been busy spreading disinformation about events via Twitter. Then there’s Trump himself. As is well-known, Trump loves to be on the winning side. Regardless of his previous stated support for Spanish union, he, seeing his political allies celebrating, will be desperate to join in. Trump is nothing if not inconsistent: witness how quick he was to disavow his support for ‘his’ candidate in the Alabama primary this week. Of course, he’s far too stupid to understand either the ins and outs of the plebiscite’s legality or the consequences of explicit US support for an unofficial referendum over the break-up of a major European power. He won’t reflect on how his actions will affect countries from Turkey to Italy to the US itself (how much does Puerto Rico gain from its status?). Trump has no consistency, no ideology, no loyalty and no strategy, and is in endless need of new distractions. That’s why I believe that in the aftermath of the vote and the near-universal revulsion that the violence has provoked, he will, with no regard for the implications, in between bouts of attacking hurricane victims, berating black sports people and trying as hard as his tiny fingers will allow him to provoke an actual nuclear war, tweet in support of independence for Catalonia. If he does, I hope the Catalan independence movement tells him very firmly ves-t’en a prendre pel cul. That would be a great symbolic statement of the kind of country they would like to build. It’s mindboggling how he got reelected. I really hope these events help people in mainland Spain (?!) see the PP. Hopefully the Left (hooray! Spain actually has one) is able to make a decisive intervention.